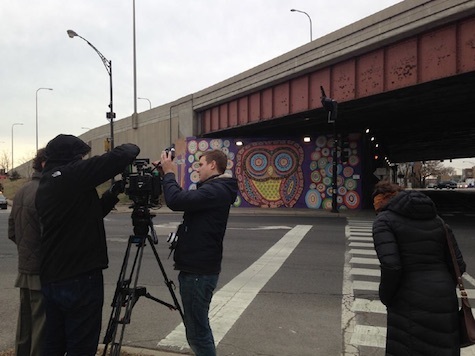 Presumably one of the people in this photo is Tim Kasher filming a scene from his new film, No Resolution, which will be screen tonight at O’Leaver’s. Lots o’ shows on this Valentine’s Day / Ash Wednesday, which is kind of odd but oh well, right? Top of the list is the big UnValentine’s Day event at fabulous O’Leaver’s featuring a screening of Tim Kasher’s epic motion picture No Resolution. Director Kasher will introduce the movie to an inebriated, possibly high O’Leaver’s crowd and will play some “UnValentine’s Day” songs before hand. I’m not sure this means he’ll actually perform songs or that he’ll be manning the O’Leaver’s soundboard/DJ booth. No matter, either way it’s worth the price of admission, which, btw, is absolutely free. The fun starts at 9. Also tonight a couple bands that usually play at O’Leaver’s are setting up cross town at Pageturners Lounge — Rusty Lord and Ocean Black. This is bound to be some “rough love” for all involved. This free show also starts at 9 p.m. Meanwhile in Benson at Reverb Lounge Sam Martin tops a bill of singer songwriter bands that include Small Houses and Midwest Dilemma. $7, 8 p.m. Finally, The Door, a new collaboration between Dereck Higgins and Aaron “Bird” Williams, will perform their debut album, Virgo, tonight at B Side of Benson Theatre, 6058 Maple Street (the old PS Collective space). Joining them is Johnna Dortch & Steven Kat Lanier. Your $15 ticket gets you a copy of Virgo. 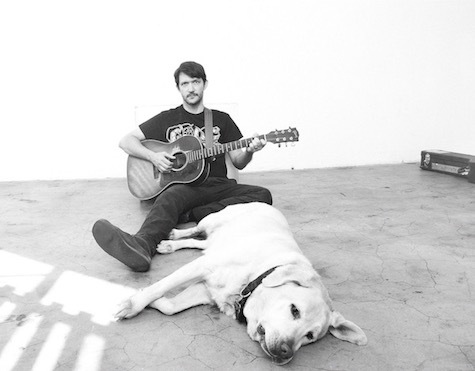 This early show starts at 7 p.m.
Tim Kasher and his band plays The Waiting Room May 12. The May issue of The Reader, which I’m not certain has hit the racks yet, includes a feature/column focused on Tim Kasher, his new album No Resolution, and more specifically, his new record label, 15 Passenger, which he operates with Cursive bro’s Matt Maginn and Ted Stevens. The story answers questions I posed about the label back in January, specifically why create a new label, how did you acquire the Cursive masters from Saddle Creek, will The Good Life be involved in the new label, and more. Kasher also talks his film No Resolution and how he hopes to screen it in the future. Don’t want to scrounge around looking for a printed copy of The Reader? You can read the whole article online right here. Kasher did the interview via phone while he was in Omaha rehearsing for the tour that brings him to The Waiting Room May 12. You should get tickets to this one while you can. The Meat Puppets with Mike Watt are headlining tonight at The Waiting Room. According to TWR website, the band could “revisit the folk and singer-song writer nuggets Curt put out in 2005 on his solo masterpiece, Snow, as well as similarly veined tracks from Rat Farm (‘Sometimes Blue’).” The Jom + Terry Show opens. According to Wiki, Jom + Terry “was the backup band led by American punk legend Mike Watt (formerly of The Minutemen and Firehose) for tours of the USA and Canada in 2001 and 2002. The band, in addition to Watt on vocals and bass, included Tom Watson (Slovenly, Red Krayola) on guitar and vocals and Jerry Trebotic on drums.” $20, 8 p.m.
Is it me or is The Brothers Lounge turning into a regular go-to spot for live music? In the past, Omaha’s most famous bar (with the best jukebox) hosted a live rock show maybe once a month, if that. These days they’re doing shows almost weekly. And anyone who knows the bar’s owners knows they know how to put on a rock show. You would be wise to follow The Brothers Facebook page (https://www.facebook.com/brothersloungeomaha/) to keep up on their many events, like the one tonight. Tonight The Brothers hosts Omaha’s hardest working noise/garage rock band, David Nance Group. Also on the bill are a couple Los Angeles bands, psych-rock act Olga and dirge band Dimples. $5, 9 p.m. The second single off Tim Kasher’s upcoming debut on Cursive’s new label, 15 Passenger, hit the internet yesterday. “Break Me Open” is a gorgeous heart-break pop song that floats on a cushion of lovely strings. Kind of reminds me of “From the Hips,” not sure why. Check it out below. Tim’s doing the presale at Bandcamp for No Resolution; the album comes out March 3. It’s been awhile, but there’s actually a touring indie rock band playing tonight at Slowdown Jr. California garage band Cherry Glazerr got its start on Burger Records, while their latest, Apocalipstick, is out on Secretly Canadian. Opening is LA-based indie band Slow Hollows (Danger Collective Records). $14, 8 p.m.
Also tonight, The Milk Run has Young and Heartless (Hopeless Records) with Kississippi (Soft Speak Records) and Museum Mouth (Equal Vision). $10, 9 p.m.